The Bahamas from space. NASA Aqua satellite image, 2009. This short video shows clouds over the island of Cuba and The Bahamas as the ISS flies from the Caribbean Sea north-east to the Atlantic Ocean. In the video, you can see Cuba is mostly covered by clouds, but the reefs in the Bahamas stand out quite nicely. The Bahamas are a group of about 700 islands and cays in the western Atlantic Ocean, of which only between 30 and 40 are inhabited. The largest of the islands is Andros Island, located north of Cuba and 200 kilometres (120 miles) southeast of Florida. The Bimini islands are to its northwest. To the North is the island of Grand Bahama, home to the second-largest city in the country, Freeport. The island of Great Abaco is to its east. In the far south is the island of Great Inagua, the second-largest island in the country. 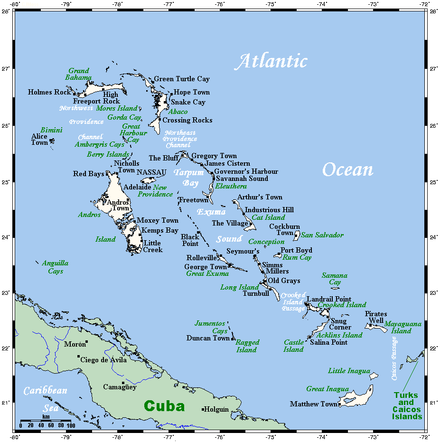 Other notable islands include Eleuthera, Cat Island, San Salvador Island, Acklins, Crooked Island, and Mayaguana. Nassau is the capital and largest city, located on New Providence. The islands have a tropical savannah climate, moderated by the Gulf Stream. The islands are surface projections of the three oceanic Bahama Banks - the Little Bahama Bank, the Great Bahama Bank, and the westernmost Cay Sal Bank. The highest point is only 63 metres (207 feet) above sea level on Cat Island; the island of New Providence, where the capital city of Nassau is located, reaches a maximum elevation of only thirty-seven meters. The land on the Bahamas has a foundation of fossil coral, but much of the rock is oolitic limestone; the stone is derived from the disintegration of coral reefs and seashells. The land is primarily either rocky or mangrove swamp. Low scrub covers much of the surface area. Pineyards are found on four of the northern islands: Grand Bahama, Great Abaco, New Providence, and Andros. On some of the southern islands, low-growing tropical hardwood flourishes. Although some soil is very fertile, it is also very thin. Only a few freshwater lakes and just one river, located on Andros Island, are found in the Bahamas. The climate of the Bahama islands is tropical savanna, with two seasons, a hot and wet summer (wet season) and dry winter (dry season). During the wet season, which extends from May through October, the climate is dominated by warm, moist tropical air masses as the Bermuda High brings a southeasterly flow from the deep tropics. Daily high temperatures are in the 31 °C (87.8 °F)range, with a dew point temperatures in the 75 - 77 F range, creating the typical hot and sultry island weather. Brief, but intense thundershowers are common with thunder and lighting. In the wet season, tropical storms and weak tropical lows may also contribute to seasonal rainfall. In dry season, extending from November through April, the subtropical high retreats, and a mix of drier northeast trade winds and occasional westerlies coming down from the North American mainland impact the Bahamas. Sunny, arid conditions prevail in the Bahamas in the dry season, and at times drought conditions can impact farming and agriculture. High temperatures during the dry season are in the 25 °C (77.0 °F) range. Annual rainfall averages 1,400 millimetres (55 in) and is usually concentrated in the August–October periods. Rainfall often occurs in short-lived, fairly intense, but brief thundershowers accompanied by strong gusty winds, followed by a return the intense sunshine and breezy conditions. Winds are predominantly easterly throughout the year but tend to become northeasterly from October to April and southeasterly from May to September. These winds seldom exceed twenty-four kilometres per hour except during hurricane season. Although the hurricane season officially lasts from June to November, most hurricanes in the Bahamas occur between July and October. Before a long lull in activity which ended in the 1990s, the last one to strike was Hurricane David in September 1979. Damage was estimated at US$1.8 million and mainly affected agricultural products. The most intense twentieth-century hurricane to strike the Bahamas was the 1929 Bahamas hurricane; winds of up to 230 kilometres per hour (140 mph) were recorded. Many lives were lost, and there was extensive damage to buildings, homes, and boats. Atlantic Ocean, chain islands in the North Atlantic Ocean, southeast of Florida, northeast of Cuba and northwest of the Turks and Caicos Islands. The terrain consists of long, flat coral formations with some low rounded hills. Hurricanes and other tropical storms that cause extensive flood and wind damage. The Bahamas are strategically located adjacent to the United States and Cuba. The Bahamas are an extensive island chain of which 30 islands are inhabited. Wikimedia Commons has media related to Geography of the Bahamas. ^ Brown, Daniel P (December 17, 2007). Tropical Cyclone Report: Hurricane Noel (PDF) (Report). United States National Hurricane Center. p. 4. Retrieved April 25, 2016. ^ Stewart, Stacy R (April 3, 2017). Tropical Cyclone Report: Hurricane Matthew (PDF) (Report). United States National Hurricane Center. Archived from the original on June 9, 2012. Retrieved April 6, 2017. ^ Beven III, John L (January 23, 2002). Tropical Cyclone Report: Hurricane Michelle (PDF) (Report). United States National Hurricane Center. Retrieved June 10, 2012. ^ Rappaport, Edward N (November 26, 1995). Preliminary Report: Hurricane Erin (PDF) (Report). United States National Hurricane Center. Retrieved June 10, 2012. ^ Beven III, John L; Stewart, Stacey R (February 8, 2009). Tropical Cyclone Report: Tropical Storm Fay 2008 (PDF) (Report). United States National Hurricane Center. Retrieved June 10, 2012. ^ Pasch, Richard J; Kimberlain, Todd B; Stewart, Stacey R (November 18, 1999). Preliminary Report: Hurricane Floyd (PDF) (Report). United States National Hurricane Center. Retrieved June 10, 2012. ^ "World Climate". Retrieved November 8, 2010. Chenoweth, Michael (1998). "The Early 19th Century Climate of the Bahamas and a Comparison with 20th Century Averages". Climatic Change. 40 (3–4): 577–603. doi:10.1023/A:1005371320672. Carew, James L.; Mylroie, John E. (1997). Geology of the Bahamas (PDF). Retrieved 9 February 2017.